Over 30 years experience as the leading Automotive part marking solutions provider! Telesis Technologies not only meets all AIAG requirements for marking, but we are part of the work group responsible for writing the various stringent specifications! From single or multi pin, electric or pneumatic Pinstamp systems to state-of-the-art YVO4, FIBER and CO2 Laser Marking Systems, Telesis continues its leading role as "The supplier" to the Automotive manufacturing sector. In fact, Telesis has VIN systems placed over 25 years ago still operating today - the longevity of our systems are matched only by our ongoing service and support of our global corporation that is part of every marking system sold by Telesis. Along with our Pinsamp systems, Telesis prides itself on our robust Laser systems like the Telesis EV4GDS - Green Laser Marker with no down time or consumables to drive your ownership costs up. This laser marker has a patented robust mechanical and optical design that can operate in industrial environments where shock, vibration and dust often cause problems for other laser and conventional marking systems. 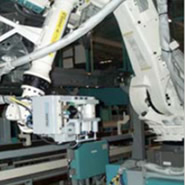 With a vast background in engineered marking solutions including robotics, vision, 2D verification and conveyor systems, Telesis offers full turnkey systems through its in-house engineering team to serve your every marking and traceability application. When it comes to automotive part marking solutions, Telesis has been "The driver" for over 30 years!